Ruth Saunders was born in Camrose, Alberta in 1923, growing up in different parts of British Columbia. After high school she volunteered with the Canadian Women’s Army Corps, and served with Kitchener, Ontario’s CWAC Military Band No. 3. 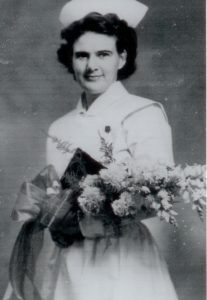 After the war she attended the Royal Jubilee Hospital School of Nursing in Victoria, graduating in early 1950. She worked for about a year at the United Church of Canada Home Mission Hospital in Cold Lake, Alberta, then joined the Church’s Missionary Deaconess School and was assigned to the United Church of Canada’s Home Mission Hospital in Manning, Alberta. After taking a short course in the Korean language at Yale University, she went to Korea as a nurse missionary for the United Church, working as a public health nurse in the hill country in southern Korea. She was particularly involved with the care of Koreans suffering from leprosy. 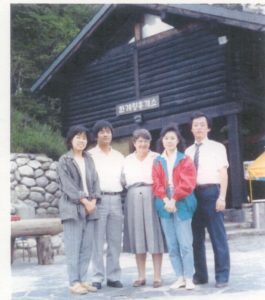 She became Nursing Administrator of the United Church’s newly built Wonju United Christian Hospital from 1955 to 1989. Here she developed a school of nursing, which is now associated with Yonsei University. She retired to live in Victoria and later Chemainus, dying in 2002. The records consist of one folder of papers related to Ruth Saunders’ life and career, particularly her time in Korea. These include copies of pages in English from the History of the Wonju Union Christian Hospital, the original of which was sent to the United Church of Canada Archives in Toronto. A copy of a presentation by Dr. Young Suk Park and Glennis Zilm, titled “Preserving a Tiger’s Treasures: Artifacts as a Research Tool,” on Ruth Saunders’ artifacts, dated June 10, 2011, is included. The original of a photocopied framed photograph of the CWAC Military Band No. 3 has been returned to the family. See also Ruth Saunders’ biographical file. Other materials on Ruth are likely available at the United Church of Canada Archives in Toronto.